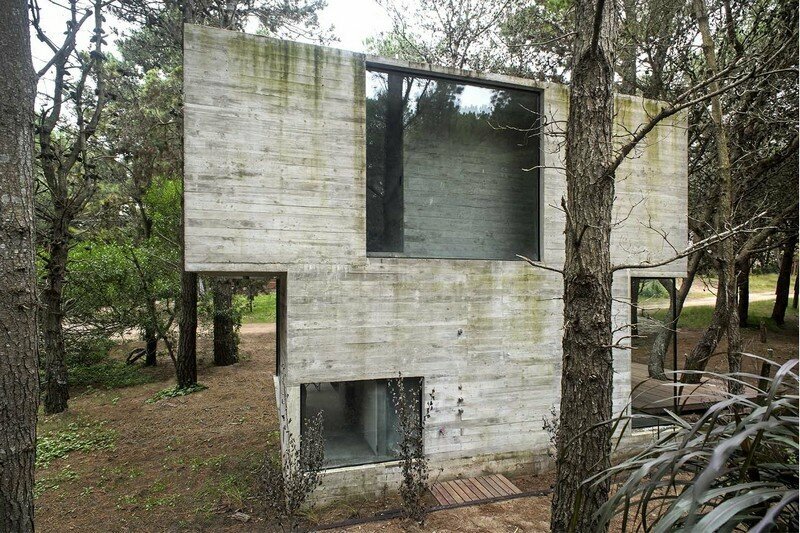 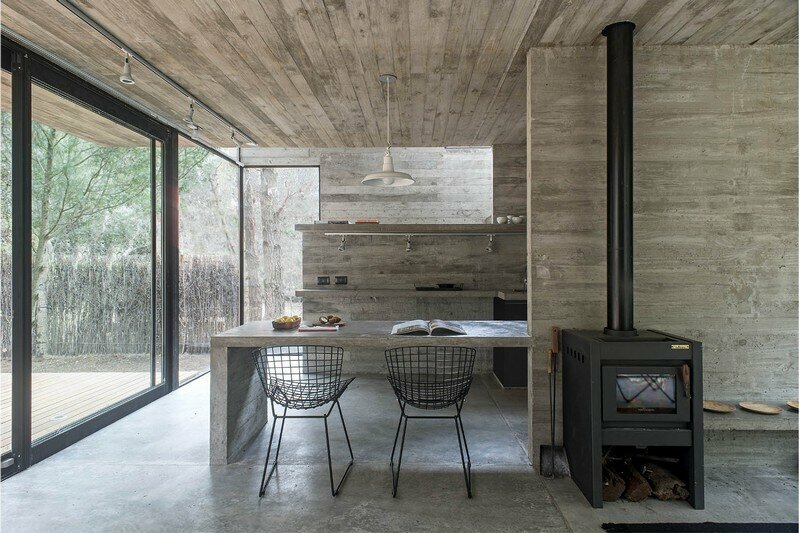 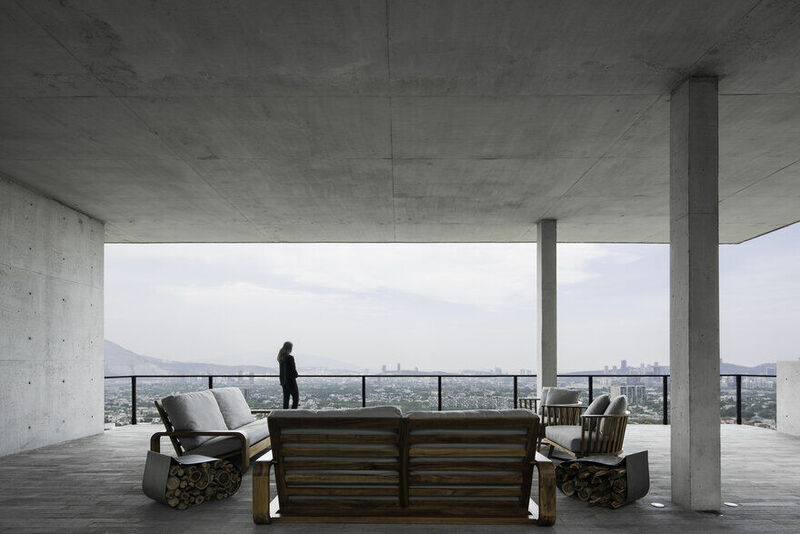 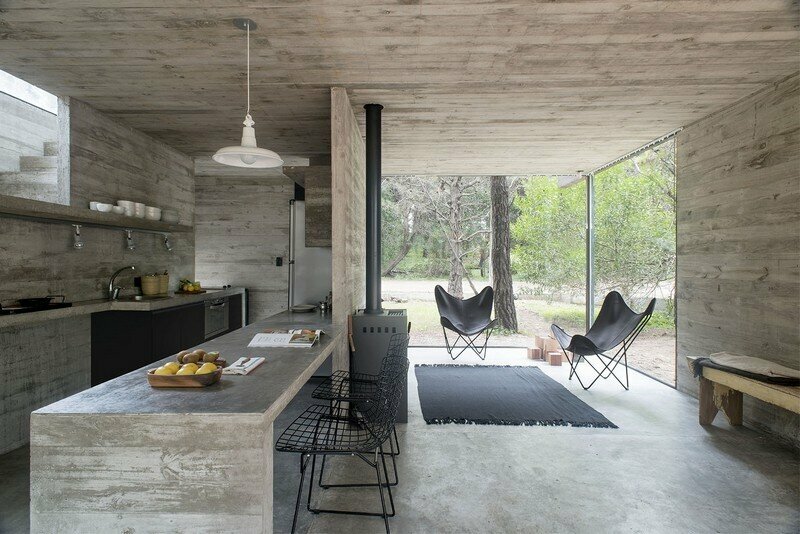 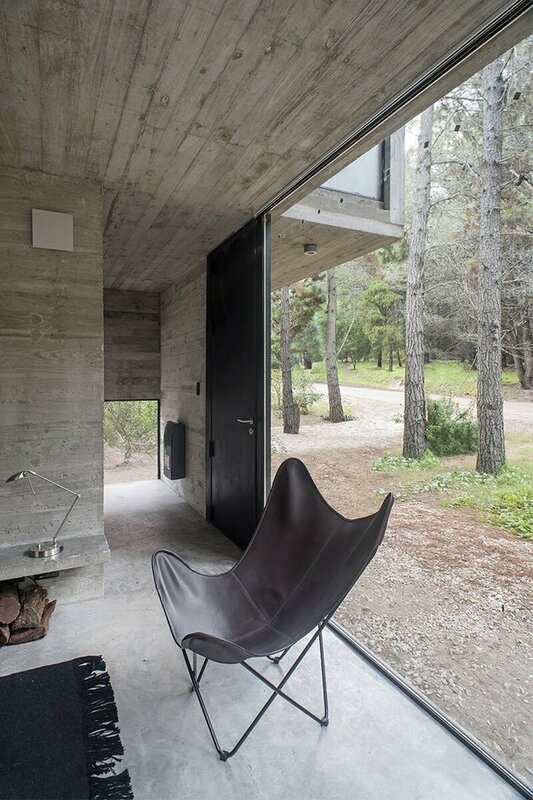 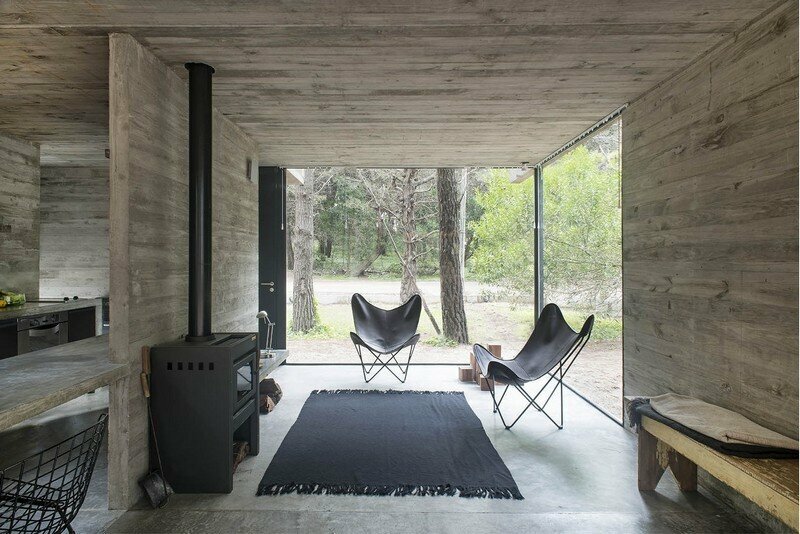 H3 House is a concrete holiday home designed by Argentinian architect Luciano Kruk. 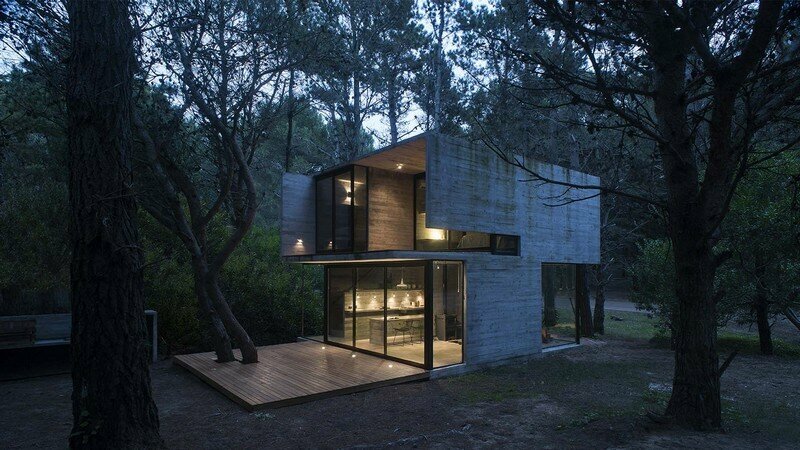 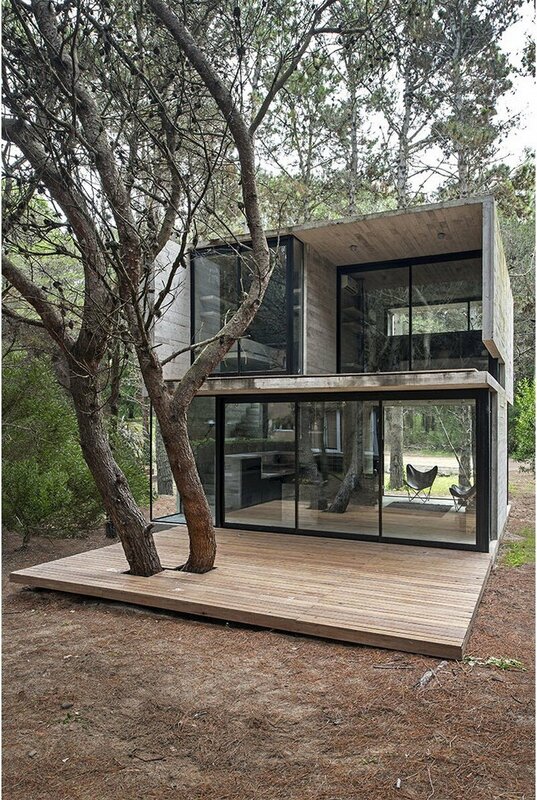 The house is located in a pine forest near Buenos Aires. 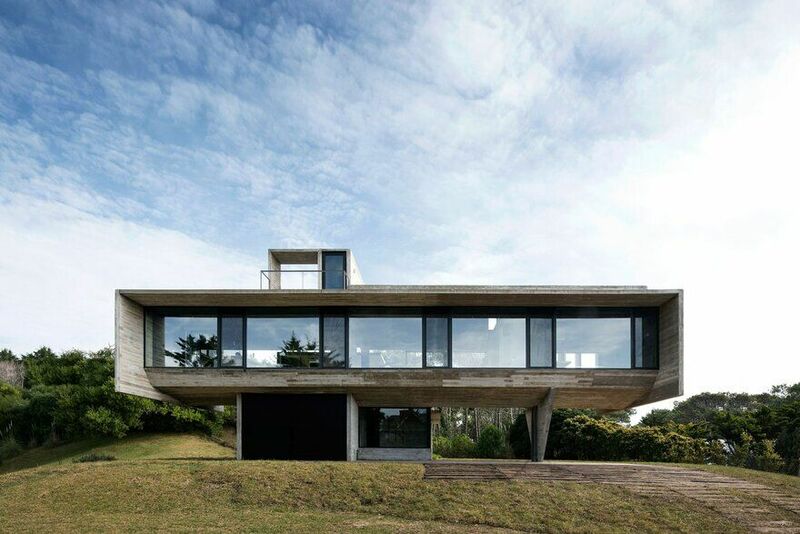 Description by Luciano Kruk: Mar Azul, a seashore town in Villa Gesell Department, neighboring Mar de las Pampas, had its sand dunes terrain divided into a grid pattern. 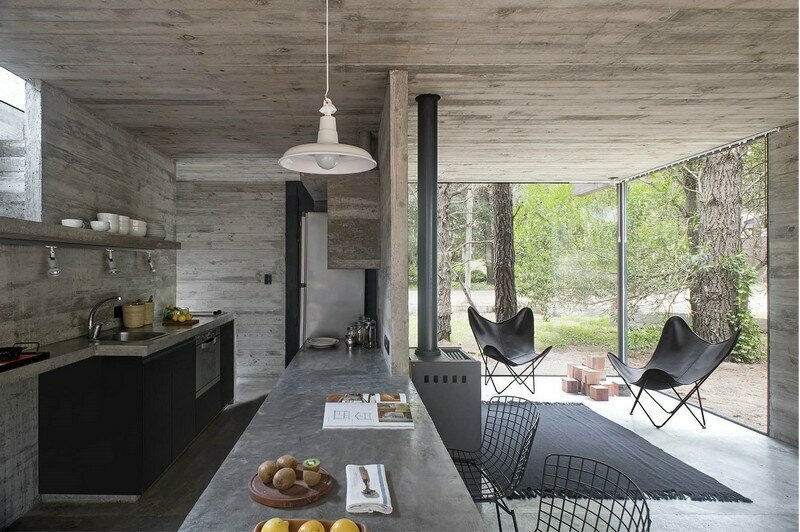 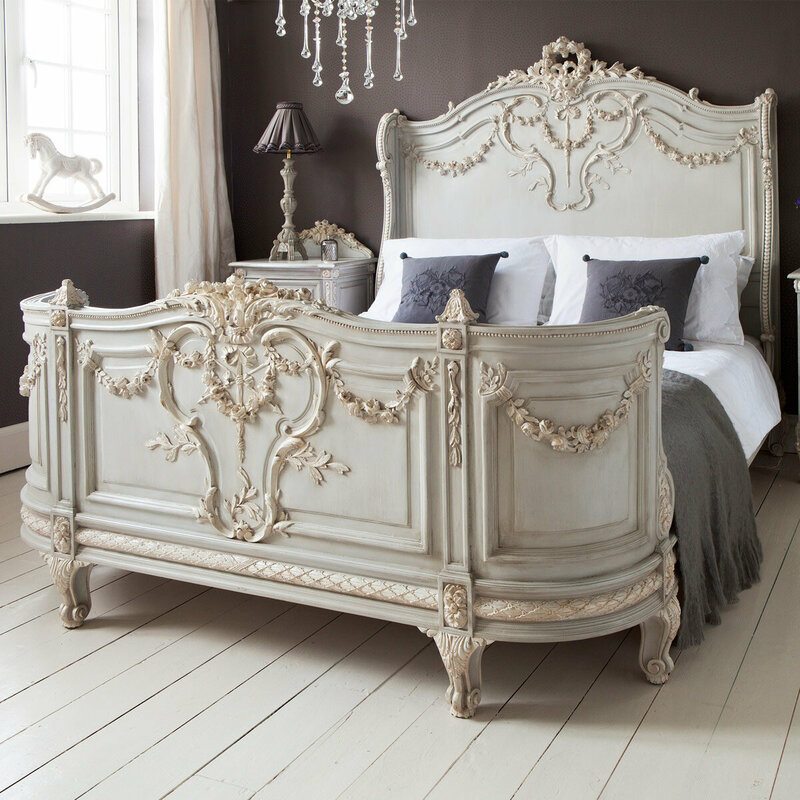 Its dense aged pinewood grants Mar Azul’s atmosphere pleasant quietness and tranquility. 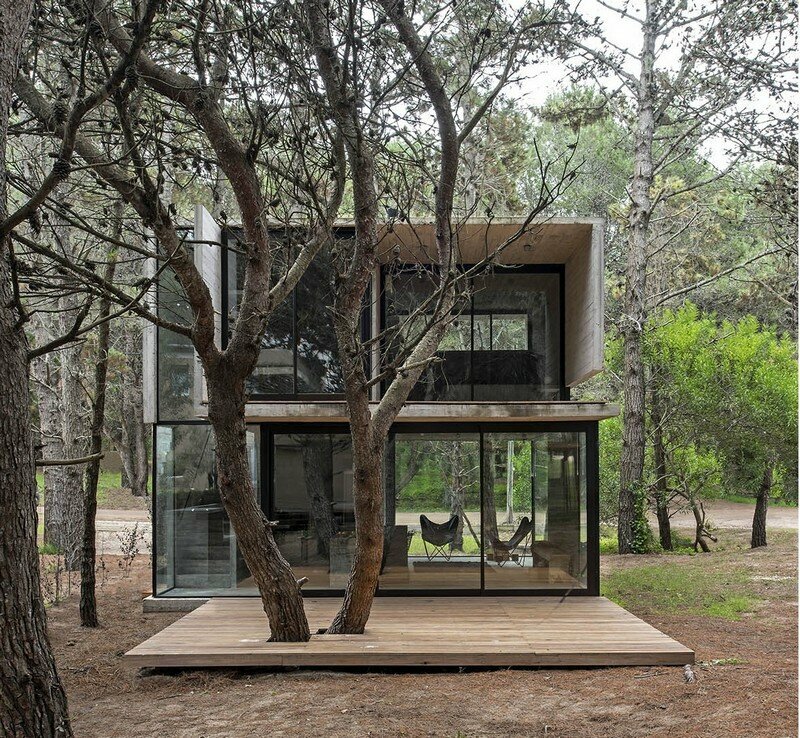 In a modest, 210 square meter plot of land on a corner, eight blocks away from the sea, rises H3, a minimum tread house designed to make the most of the parcel’s dimensions and the natural surroundings. 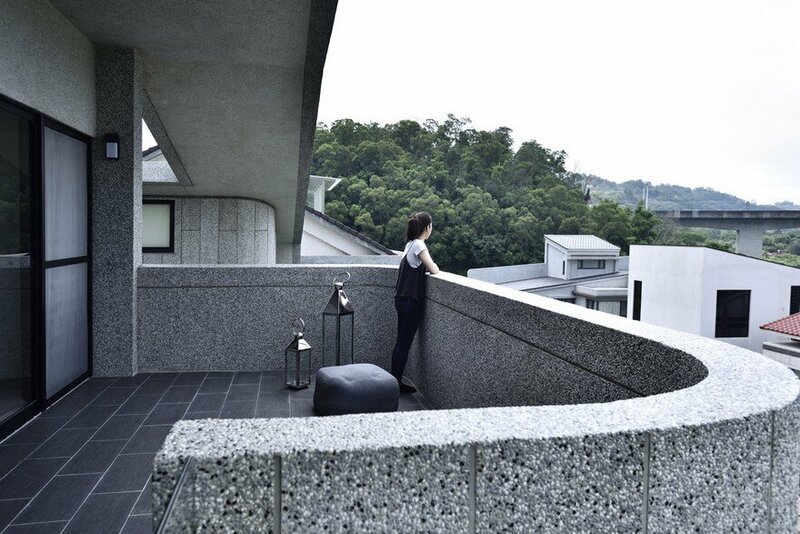 The commissioner: 3 sisters and each of their families. 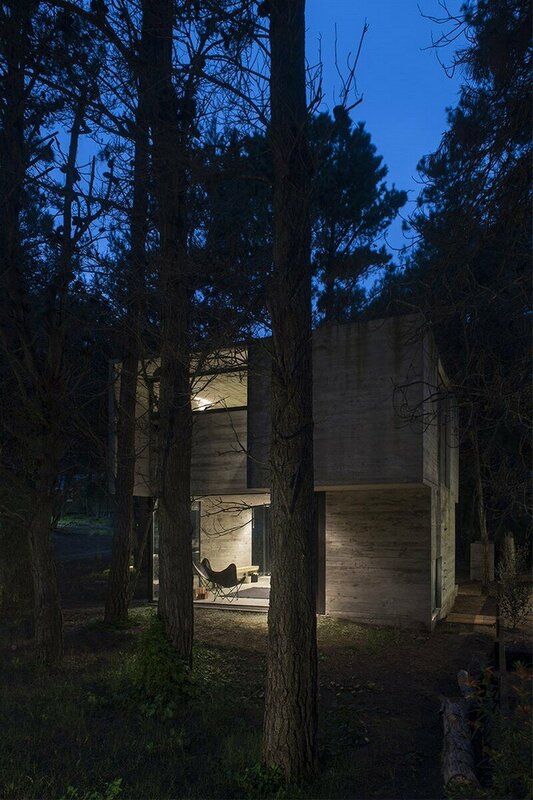 The house’s materiality was agreed on by the studio and the commissioners. 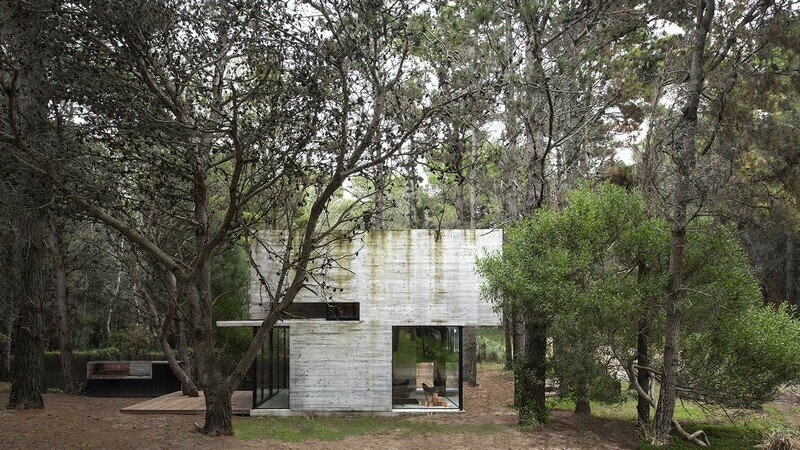 H3 House was completely built in exposed concrete, which served well to the maintenance moderation. 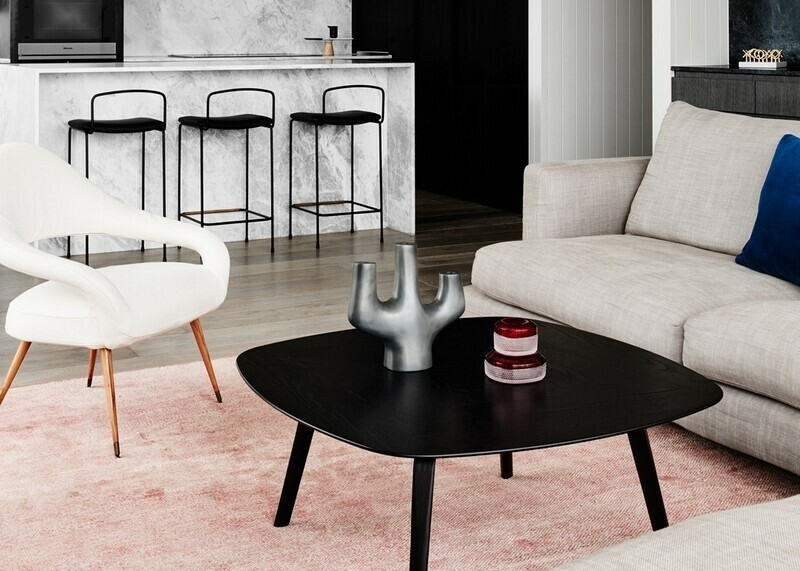 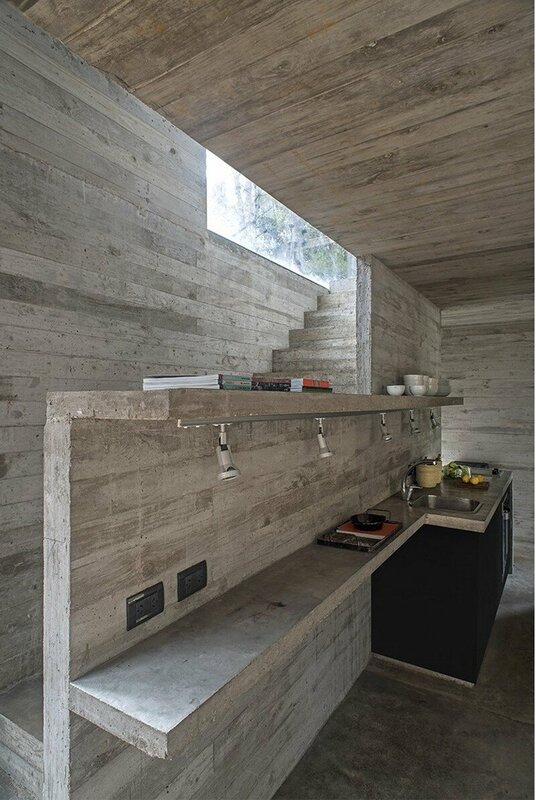 Intending to keep the needs for equipment at a minimum, even furniture was conceived as a part of the concrete volume. 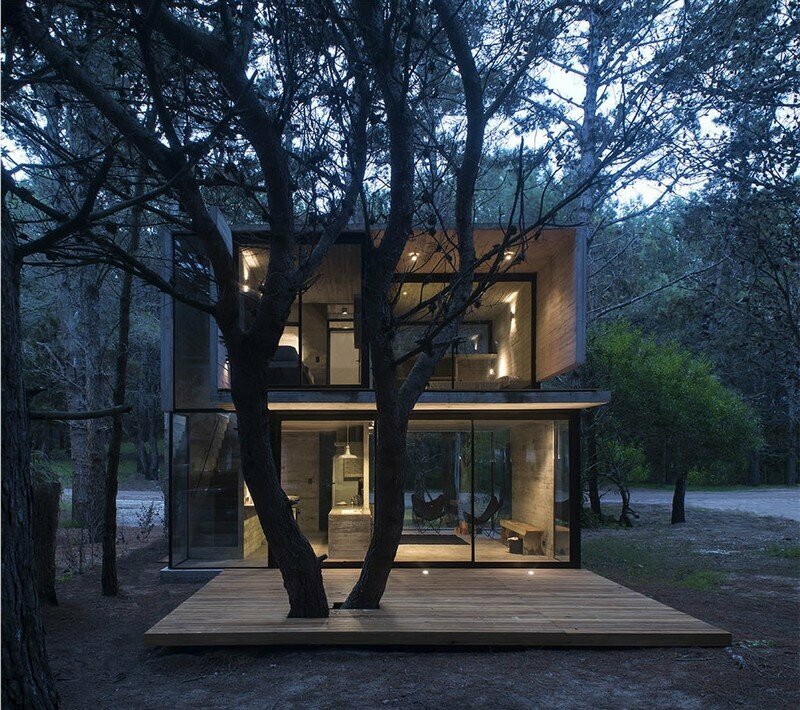 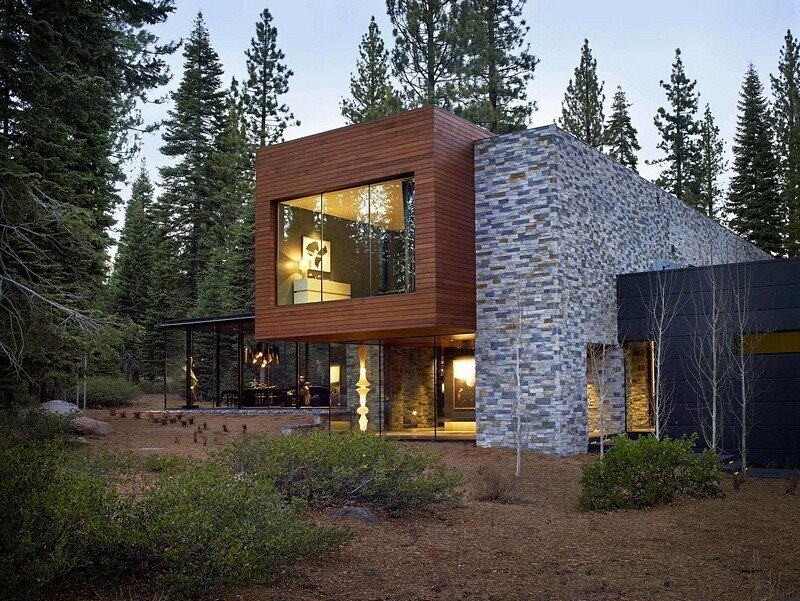 The H3 house was constituted as a compact block. 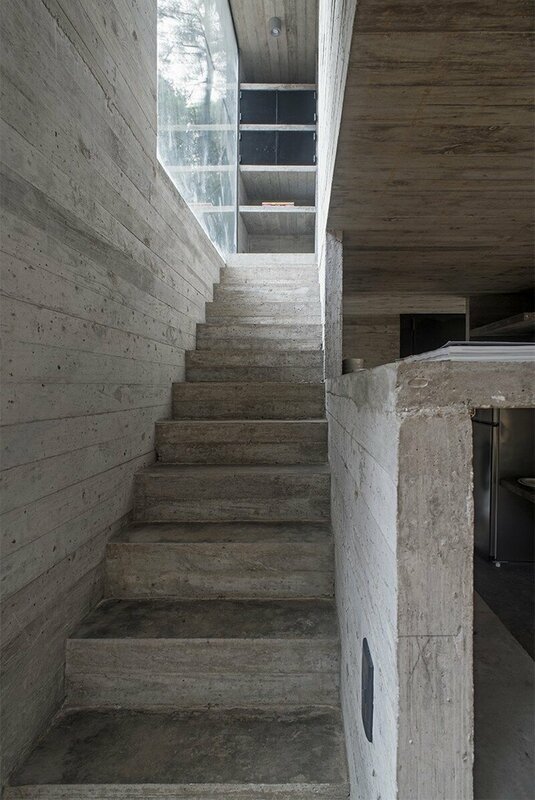 The ground floor houses the kitchen, the dining room and the living room, all in an integrated space from which the staircase emerges towards the first floor. 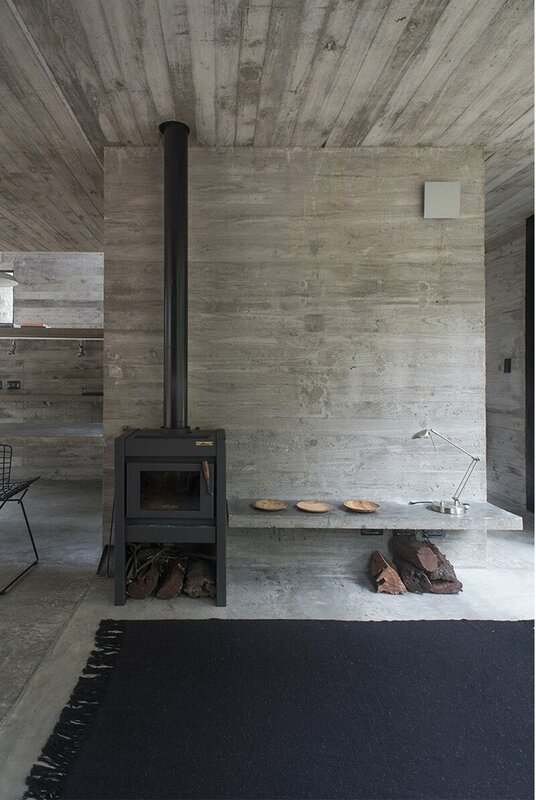 Given the house’s scale, the use of crossed views and vanishing points aimed at unifying and fluidifying the space in the room. 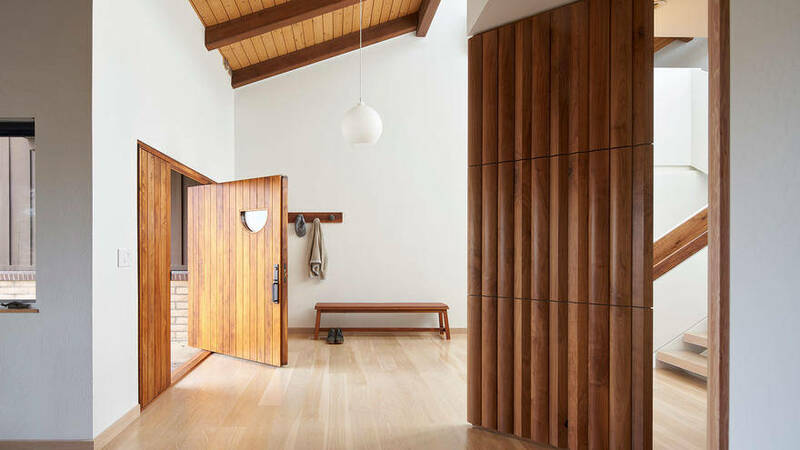 Instead of confining the house’s different uses into separated rooms, they have been connected with each other, aiming at producing the general feeling of spatial expansion. 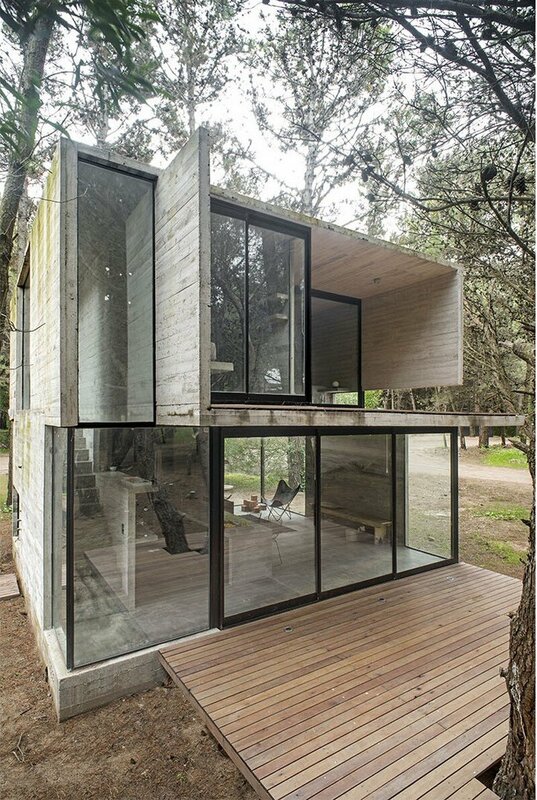 As requested on the brief, the bedrooms and the bathroom were located upstairs, but the main bedroom’s outdoor semi-covered space was designed to be shared with the secondary bedroom. 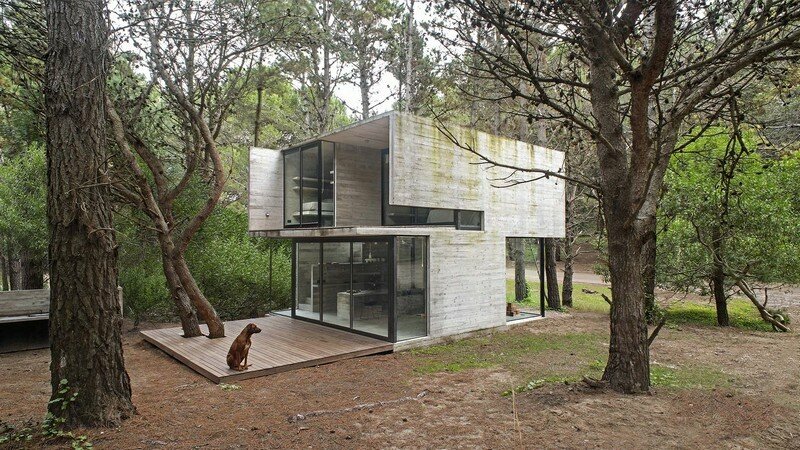 Additionally, it would partially work as the roof for the downstairs deck. 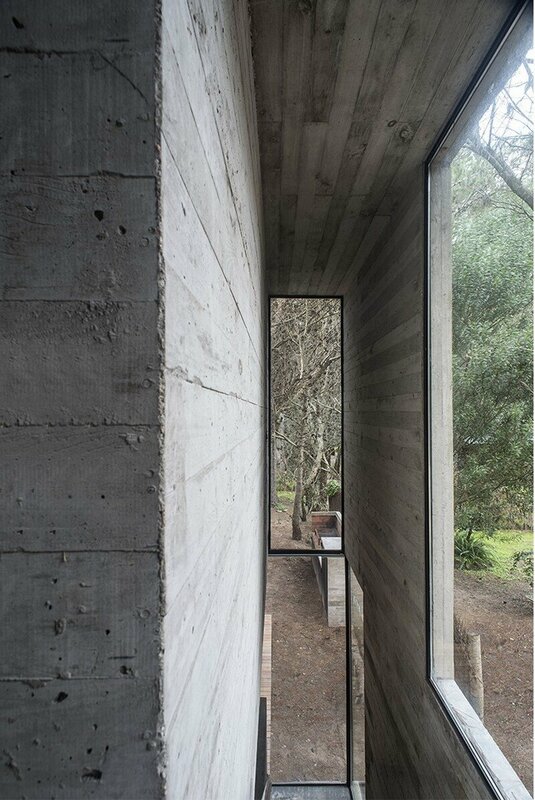 Overhangs and partitions preserve the house both from the effects of water and the sight from the streets. 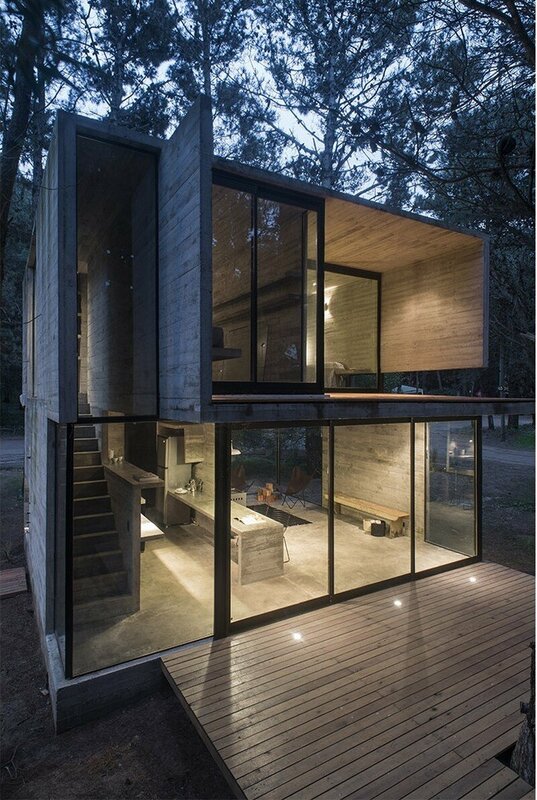 Also, the volume housing the bathroom shelters the entrance to the house. 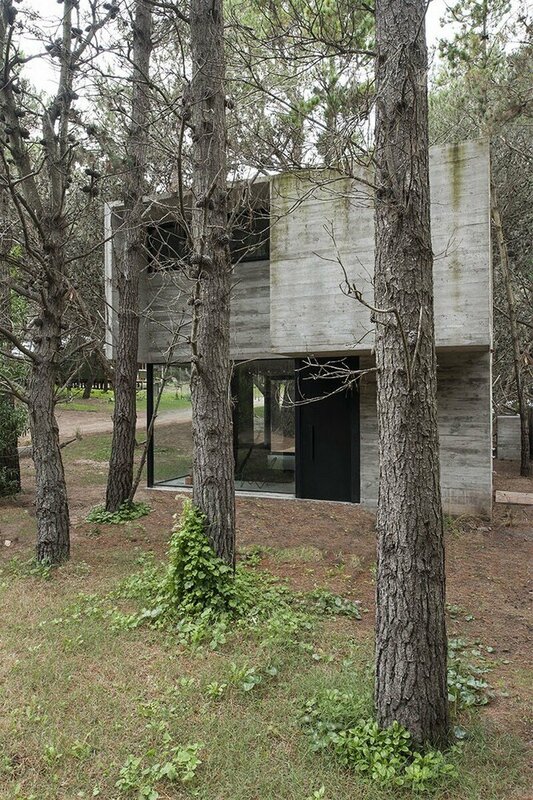 While the sidewalls are mainly blind, the front upstairs show the blind volume housing the bathroom and the high windows of the main bedroom, under which a storeroom lies inside. 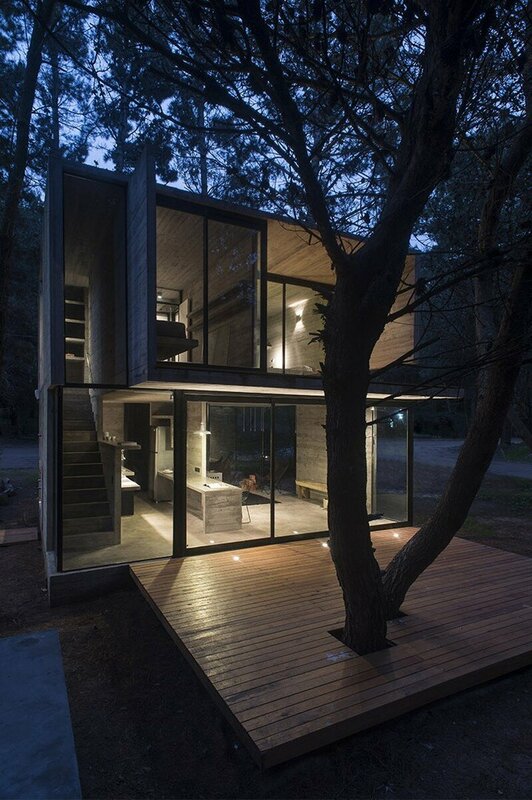 On the rear, floor-to-ceiling windows connect both windows with the outdoor deck they share. 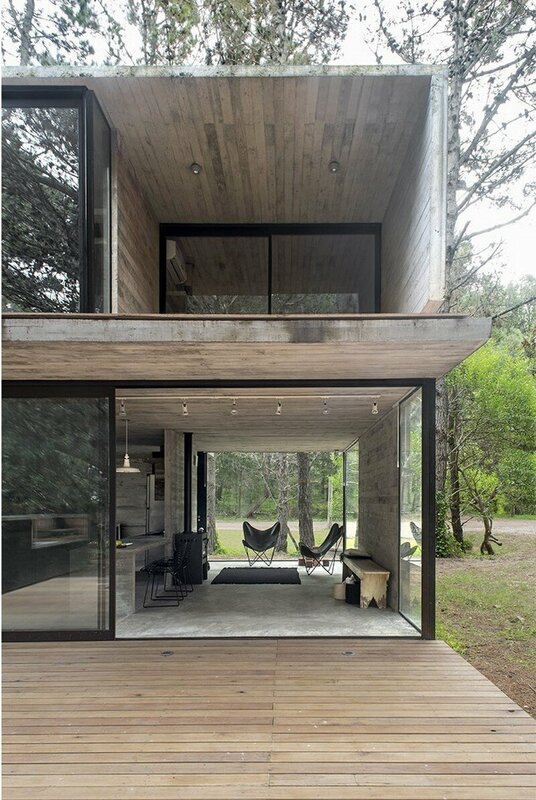 Unlike what happens upstairs, floor-to-ceiling windows open the ground floor from its entrance towards the opposite side. 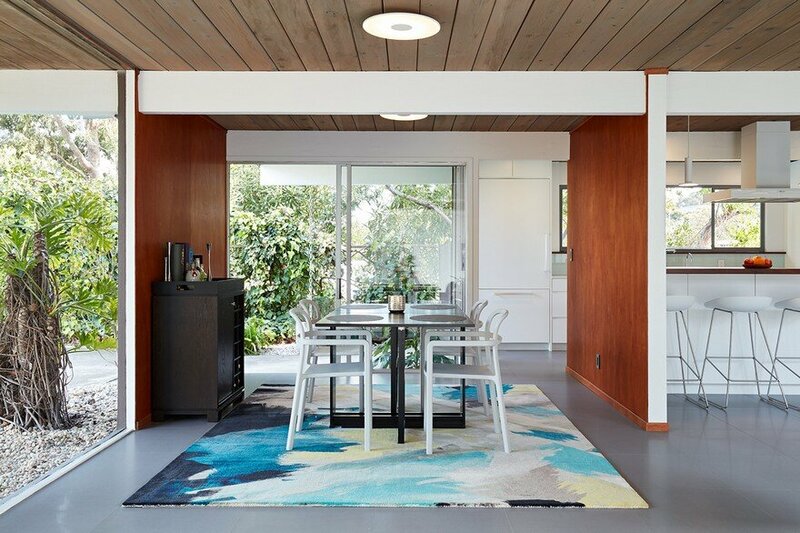 When we designed this floor plan, we aimed at making it feel both like an indoor space, sheltered by the roof and the windows, but at the same time, somewhere in between in a continuum with the outside. 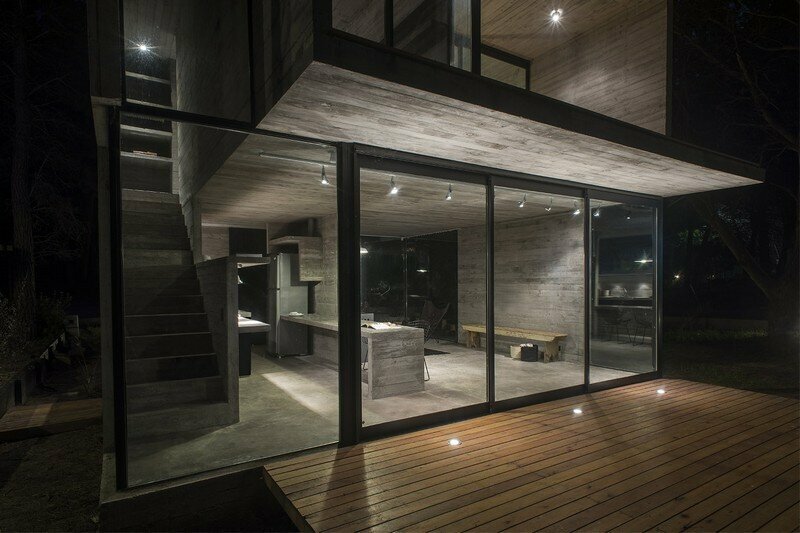 In this way, the layout of the house is the result of an architectural synthesis of the sisters’ intentions and desires. 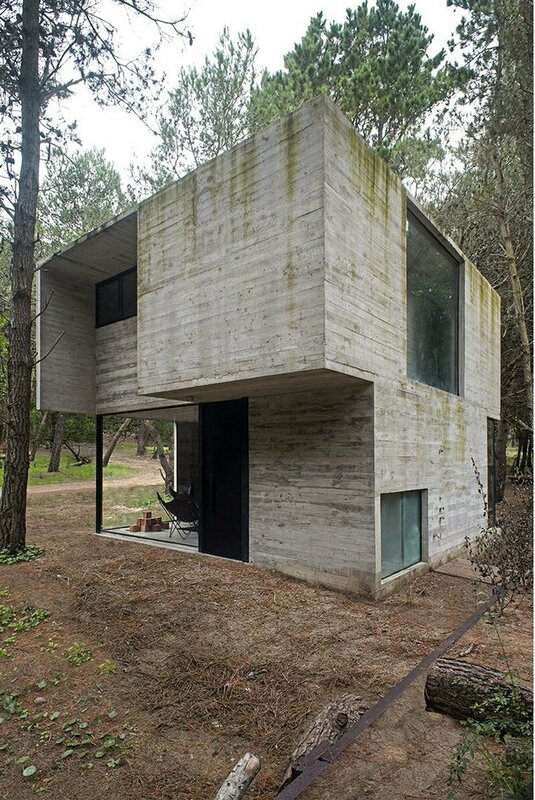 In its minimum scale, the house rises by its own will, but also integrates itself respectfully with its surroundings, both natural and human-built.